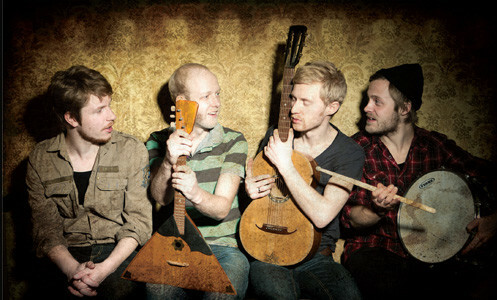 Ewert and The Two Dragons is an Estonian indie-rock band whose line-up consists of vocalist Ewert Sundja, guitarist Erki Pärnoja, drummer Kristjan Kallas, and bassist Ivo Etti. Their distinctive name came from a movie that Sundja was a fan of and although the name states that there are three people in the group, the band describes “one of the dragons to have two heads”. The group members are friends who dreamed of rock stardom from an early age, while listening to and being influenced by the likes of Radiohead, Jeff Buckley, The Police, The Beatles, The Rolling Stones, Blur and others. Ewert Sundja, Erki Pärnoja and Kristjan Kallas first started playing together in 2008 and in 2009 recorded their debut album The Hills Behind The Hills over three days at the summer cottage of Ewert Sundja’s in-laws in Estonia. Soon afterwards the bassist Ivo Etti joined the band and the follow-up album Good Man Down followed in 2011. The band quickly gained recognition, first in Estonia and Latvia, and futhermore in Finland, Netherlands and France. The Dragons recently embarked on a European tour, which has taken them to woo the audiences in Finland, Netherlands, France, Italy, Germany and Britain. In Germany they played at the Reeperbahn Festival in Hamburg, while in the UK they dominated the stage this week at the Borderline in London – a venue which has played a host to Amy Winehouse, Belle & Sebastian and Pulp among others in the past. Futher concerts will take Ewert and the Two Dragons to Toronto in Canada and Denver, Salt Lake City, Chicago, Washington, New York and Los Angeles in the US.